Hotel Muse Bangkok tells stories through flavors, an intriguing mix of local and international cuisines, creative cocktails served at the top restaurants in Bangkok. Located in the sophisticated neighborhood of Chidlom, Hotel Muse Bangkok is home to three unique dining outlets, each offering a carefully selected mix of local specialties, worldly dishes and inspired drinks. These top restaurants in Bangkok include Medici Kitchen & Bar, Babette’s The Steakhouse and The Speakeasy Rooftop Bar. You will see how this delicious story unfolds at every turn, from the authentic cuisines served in the inviting atmosphere of the signature restaurant to the locally inspired cuisine featured at the rooftop bar. Located in the basement of Hotel Muse Bangkok, Medici Kitchen & Bar is an award-winning Italian restaurant that shines Inspirational Italian cuisine in the spotlight. Appointed to be the best Italian restaurant in Bangkok for three years in a row by Thailand Tatler, the dining experience at Medici Kitchen & Bar is incredible. Executive chef Bart Cywinski combines the freshest ingredients and crafts an innovative menu. Using modern culinary techniques, he presents dishes that’ll pique your interest and pleasantly surprise your palate. Medici Kitchen & Bar also boasts an open-kitchen concept, which adds theater elements to the dining experience. With a regular entertainment program, Medici Kitchen & Bar lets you indulge in culinary creations while enjoying live music and opera performances as well. At Medici Kitchen & Bar, you’ll find a collection of land and sea combinations on the menu. Combining sea delicacies and earthly delights, these dishes gives you the best of both worlds. Seafood lovers will enjoy the poached Boston lobster and the roasted snow fish. While the flaky and buttery fish is served with mouthwatering parmesan polenta, the lobster comes with pillow-soft dill gnocchi. Medici Kitchen & Bar is easily one of the top restaurants in Bangkok. Situated on the 19th floor of Hotel Muse Bangkok, Babette’s The Steakhouse draws inspiration from the classic 1920’s. The steakhouse features bold plum-red accents, high ceilings and comfortable upholstered armchairs. All the sleek, American-retro furnishings and colors combine to lend this dining space elegance from the yesteryears. From succulent steaks to juicy chops, Babette’s The Steakhouse offers some of the finest cuts of imported meats. To name a few signature dishes: luxurious beef Wellington made from grain-fed Australian tenderloin and served with aromatic mushroom duxelles, flame-grilled bone marrow salad paired with homemade dipping bread and a signature veal osso buco which is a slow-braised milk-fed veal served with either truffle potato cream or rosemary risotto. However, this top restaurant in Bangkok is not only limited to meat lovers. Aside from Wagyu sirloin and lamb racks, there is also a selection of grilled seafood, poultry and vegetables. Seafood enthusiasts will want to order the grilled seafood platter, which includes luscious lobster, tiger prawn, juicy squid and Hokkaido scallops. Aside from an irresistible menu and sophisticated setting, this top restaurant in Bangkok also features a stellar collection of wine. Our walk-in cellar showcases a wide range of dynamic vintages from around the globe. If you look carefully, you might even find rare bottles from the New and Old World. Perfect for seafood creations such as scallops and prawn cocktail, the Champagne is a fine, refreshing sip to start the evening. For those who enjoy before-dinner drinks, there is also a selection of classic American cocktails. A golden dome against the Bangkok skyline, The Speakeasy Rooftop Bar transports you to the yesteryears of America. Inspired by the 1920s, this iconic bar revives the cocktail scene of the prohibition era by serving a handful of classic cocktails and creative concoctions. 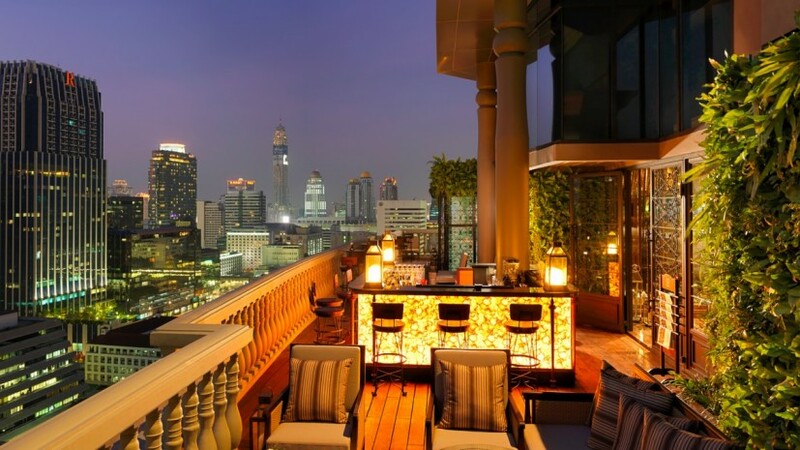 Featuring spectacular skyline views, The Speakeasy Rooftop Bar is a multi-level bar that is located on the 24th and 25th floor of Hotel Muse Bangkok. With well-made drinks and an inviting atmosphere, The Speakeasy Rooftop Bar is a cozy spot that can’t be found anywhere else. Named The World’s Best Bar in Asia by The Spirits Business in 2019, The Speakeasy Rooftop Bar showcases a fun menu of Thai-inspired international bites. With a strong food concept, it is also one of the top restaurants in Bangkok. The stunning rooftop bar offers sumptuous sofa seating, upbeat tunes from a live DJ and a sharing menu. Here you can order juicy burger sliders, locally inspired pad krapow with crispy pork and delicious quesadilla with spicy chicken and cheese filling. The options are endless. The Speakeasy Rooftop Bar showcases all sorts of captivating cocktails, from sweet and refreshing to bitter and aromatic. While the mixologist specializes in making classical and contemporary cocktails, the talented mixologist can also craft a customized cocktail that is catered to your tastes. The rooftop bar also boasts an impressive Gin Library that features more than 75 types of different gins. 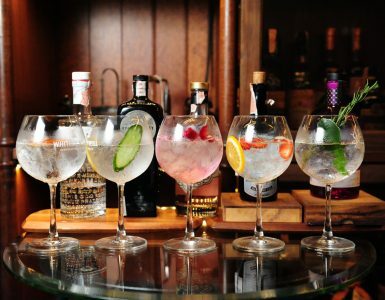 Gin lovers will enjoy sampling a couple of gins and tonic with special infusions.